The destructive ability of free radicals has come to the forefront of modern research. When free radicals overwhelm the body's endogenous antioxidant system, damage can occur due to the instability of its unpaired electrons, triggering a cascade that results in oxidative damage to muscle tissues. The paradox of life is that while the vast majority of living organisms require oxygen to maintain their cellular activities, it is this oxygen that ultimately leads to the highly reactive oxygen species (ROS). This response is heightened during times of increased energy demand, as in unaccustomed eccentric exercise. The free radicals produced during eccentric exercise promote the oxidation of lipids, carbohydrates, and proteins to a point at which they are no longer recognized by their usual receptors, but are instead recognized by scavenger receptors on macrophages. The binding of oxidized molecules to this receptor promotes the uncontrolled intake of the oxidized molecules and ROS, resulting in cellular apoptosis, an inflammatory response, and tissue damage. This process continues until the ROS is deactivated by another ROS, or until an antioxidant intervenes. While some reports suggest there is no potential benefit from antioxidant supplementation in relation to a bout of resistance exercise[4-6], others indicate that a potential beneficial role does exist[7-10]. Among the most widely studied antioxidants pertaining to exercise-induced oxidative stress is vitamin E (alpha- tocopherol). The similar structure of polyphenolic compounds and vitamin E suggests that polyphenols in berries may have the same antioxidant-like effect, and may result in attenuation of exercise induced oxidative stress. The most abundant antioxidants in the diet are polyphenols. Anthocyanins are a type of polyphenol found in the pigmented skins of berries and are responsible for anti-inflammatory responses by inhibiting cyclooxygenase activities in activated macrophages. In preliminary human studies, cherry consumption was found to relieve symptoms of arthritis, suggesting that cherries may have anti-inflammatory effects, and therefore may be an effective supplementation to combat exercise-induced oxidative stress. Although research of antioxidants has become popular within the past ten years, there have been only two known studies to investigate the effect of cherry ingestion on inflammatory responses of muscles and prevention of symptoms of muscle damage. Kelly et al. found that consumption of 45 cherries a day was sufficient to reduce the concentration of the inflammatory marker CRP in healthy men and women. Connolly determined that consumption of tart cherry juice decreased symptoms of muscle damage, including strength loss and pain, following maximal eccentric exercise. In addition to the inflammatory and muscle tenderness markers assessed by Connolly, blood plasma allows an insight into the extent of the muscle injury and oxidative stress by measuring changes in blood biomarkers. When trauma occurs to the muscle tissue following strenuous exercise, creatine kinase and myoglobin migrate out of the damaged cells and can be used as an indicator of muscle membrane damage or permeability changes to the plasma membrane. Plasma biomarkers of oxidative damage include protein carbonyls, a skeletal muscle protein oxidative stress biomarker, and thiobarbituric acid reactive substances (TBARS), a lipid peroxidation marker. Antioxidants have the ability to reduce the harmful effects of oxidative stress and tissue damage by donating an electron to stabilize free radicals while remaining stable itself. In doing so, antioxidants may reduce the inflammation and tissue damage resulting from exercise-induced oxidative stress. This was supported by Kelly et al. who found that the polyphenols in cherries have an anti-inflammatory effect on muscle tissue following a bout of eccentric resistance exercise. No other study to date has thoroughly investigated both oxidative and tissue damage biomarkers simultaneously following eccentric exercise and cherry supplementation. We propose to examine the protective effects of cherry supplementation with high phenol content following a strenuous bout of eccentric resistance training by assessing range of motion, arm girth, arm volume, punctuated tenderness, perceived soreness, strength measures, biomarkers of oxidative stress (protein carbonyls and TBARS), and a biomarker of inflammation (CRP). Fourteen healthy, untrained subjects (females n = 10, males n = 4) volunteered for this double-blind cross-over study. Subjects had no history of shoulder injury within the past year. Physical characteristics (x¯ ± SE) for age, weight, height, and estimated percent body fat were 21.3 ± 2.8 y (range 19-30 y), 72.2 ± 13.9 kg, 158.0 ± 30.4 cm, and 24.7 ± 13.4 %, respectively. Study approval was met by the institutional review board, and following an explanation of procedures, risks, and benefits, each subject gave informed consent to participate in this study. Subjects were randomly assigned to ingest either an antioxidant supplement (S) (n = 14) or a placebo (P) (n = 14) in a double blind cross-over design. Both tablets were visually identical. The P tablet consisted of cooking oil and red #3 food coloring. A single S tablet (Brownwood Acre Foods Inc. , Eastport, MI) consisted of CherryFlex® Paste (tart cherries), olive oil, gelatin, glycerin, purified water, beeswax, and soy lecithin to provide 100 mg anthocyanins, 20 mg Flavones, and 30 mg tannins, melatonin, and two flavonoids – isoquercitrin and quercitrin. Subjects consumed one tablet twice a day for a total of 16 d prior to the eccentric protocol and for 3 d following the eccentric protocol. During the experimental period, subjects agreed to stop ingestion of chocolate, tea, citrus fruit, alcohol, caffeine, juice, berry ingestion of any kind, vitamin supplements (including vitamins, minerals, amino acids), aspirin, ibuprofen, and smoking. This restriction allowed for a 16 day supplementation washout and recovery period between trials. Subjects completed daily food records for 3 d following the eccentric protocol, and refrained from any therapeutic modalities, including body massage and exposure to hot tubs or hot showers, for the duration of the study. Subjects were to refrain from unaccustomed exercise at least 7 d prior to and 3 d after the eccentric protocol. Sixteen days prior to eccentric exercise, subjects reported to the laboratory for baseline blood sampling and measurements. Height and weight were recorded on a scale, and body composition was determined using a bioelectrical impedance unit (Bio-Stat Diagnostic Systems, Douglas, British Isles). Subjects were provided with 40 S or P tablets at this time and began ingesting the pills and adhering to the dietary guidelines and restrictions. Subjects returned to the lab one day prior to the eccentric protocol for a second blood draw. On the day of the eccentric protocol, subjects reported to the lab for pre-exercise data collection, eccentric exercise, and post-exercise blood draws. Data collection consisted of duplicate measures for range of motion (ROM), arm girth, arm volume, punctuated tenderness, pain scale, and strength measure. Initial data collection was followed by the eccentric protocol, and included blood draws immediately post-exercise, 2, 4, 24, 48, and 72 h post-exercise. Data collection was again performed 12, 24, 48, and 72 h post-exercise. Upon completion of the first 19 d trial, another 19 d trial utilizing the same data collection and exercise protocol was used for the contralateral arm and the opposing treatment. 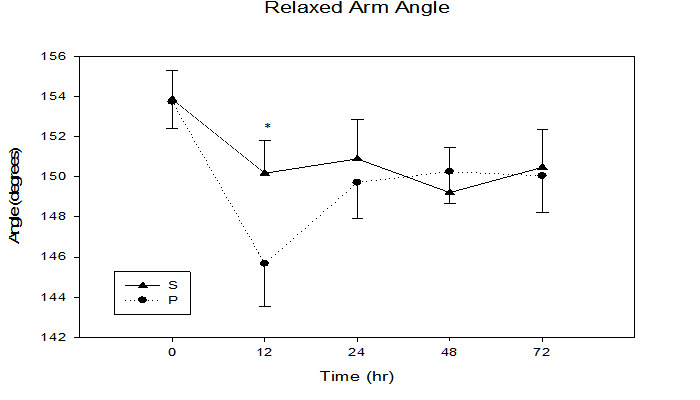 ROM: Relaxed arm angle (RAA) and flexed arm angle (FAA) were measured using a plastic goniometer (Pro-Med Products, Atlanta, GA) on the exercised arm to determine ROM. Permanent marker was used to mark the styloid process of the radius, the lateral epicondyle of the humerus, and the midpoint of the acromion process to ensure inter-day accuracy. RAA was measured in anatomical position with the exercised arm fully relaxed at the side. FAA was measured as the subject actively flexed the elbow joint in an attempt to touch the palm to the shoulder while keeping the wrist straight. Numerical pain scale: Following 5 repetitions of elbow flexion and extension of the exercised arm, subjects were asked to mark on the VAS (0 cm = no pain, 10 cm = maximal pain) corresponding to perceived pain of motion. Punctuated tenderness: A standard manual muscle myometer (Wagner FPK Mechanical Algometer, Greenwich, CT) was used to assess the minimum force (kg) (applied at 1 kg•s-1) required to induce pain or discomfort. Measurements were taken 2, 4, 8, 12, 16 cm proximal to the antecubital fold along the midline of the biceps brachii, and 3.8 cm distal and lateral to the middle of the antecubital fold. Arm girth: Arm girth was assessed at sites one-third and twothirds the distance from the acromion process to the olecranon process, 2 cm proximal to the olecranon process, and 3.8 cm distal to the antecubital fold on the exercised arm. Arm volume: Arm volume was measured using a plexiglass volumetric set (Dyantronics 7030 Salt Lake City, Utah) with the water temperature maintained at 37°C. Subjects steadily lowered the exercised arm down the center of the volumeter until the middle finger touched a positioning bar near the bottom of the volumeter. Displaced water was collected in a graduated cylinder and used to assess arm volume. Strength: Four consecutive maximal contractions were used to assess post-exercise strength (peak torque & work) while seated on the Biodex System 3 Pro (Biodex Medical Systems Inc, Shirley, NY). The contractions were performed through a range of motion of 5° short of full extension to 5° short of full flexion at a velocity of 30°•s-1. Subjects completed one warm-up set of 5 sub-maximal contractions, followed by one set of four maximal contractions. Exercise Protocol: Subjects were positioned on the Biodex System 3 Pro for eccentric arm extension. Arm range of motion for the exercise protocol was from 5° short of full flexion through 127° of extension at a velocity of 30°•s-1. All subjects performed 1 set of 10 submaximal contractions, followed by 5 sets of 10 maximal contractions with peak torque and work recorded. Two minutes of rest was given between contraction sets. Biochemical analysis: Blood was drawn 16 d and 1 d prior to eccentric exercise, immediately post-exercise, and 2, 4, 24, 48, and 72 h post-exercise from the antecubital vein of the non-exercised arm. Blood was centrifuged (Beckman Gs-15R Centrifuge, Palo Alto, CA) at 700 x g for 8 min at 4°C and plasma was stored immediately in deep freeze (Revco, Kendro Lab Products, Asheville, NC) at -80°C until biochemical analysis at a later date. All assay procedures detailed below were performed in duplicate with absorbance measured using a 96-well micro-plate compatible with a spectrophotometric plate reader (Bio-Tek Power Wave XS, Winooski, VT). Protein carbonyls: The concentration of protein carbonyls was determined using the procedure outlined by Cayman Chemical's Protein Carbonyl Assay Kit (Ann Arbor, MI) following laboratory preparation of the reagent solutions. The absorbance was measured at 360 nm and results expressed in μg•ml-1 protein. Myoglobin: Myoglobin was determined using Human Myoglobin Enzyme Immunoassay (Diagnostic Automation, Inc) with a sensitivity of 5 ng•ml-1. Absorbance was measured at 450 nm and results expressed as (ng•L-1). C-Reactive protein: C-Reactive protein (CRP) was determined with use of a High Sensitivity C-Reactive Protein Enzyme Immunoassay Test Kit (Diagnostic Automation Inc., Calabasas, CA) with a functional sensitivity of 0.067 mg•L-1. The absorbance was measured at 450 nm and results expressed in mg•L-1. TBARS: The amount of aldehyde production resulting from lipid peroxidation was quantified following laboratory preparation of reagent solutions. 100 μL plasma was first mixed with 100 μL of SDS Lysis Solution and incubated at room temp for 5 min. 250 μL of TBA Reagent was added, mixed, and incubated at 95°C for 45-60 min. After cooling on ice, all samples were centrifuged (Beckman Gs-15R Centrifuge, Palo Alto, CA) at 1000 x g for 15 min. The absorbance of the supernatant was read at an absorbance of 532 nm and results expressed in μm•L-1. Creatine kinase: Plasma creatine kinase production was determined using the ECPK-100 (BioAssay Systems, Hayward, CA). The absorbance was read at 340 nm after 10 min and again at 40 min. The change in absorbance of the sample was compared to a calibrator and water control to determine creatine kinase activity (U•L-1). Statistical Analysis: Dietary records were compiled using Diet Analysis Plus 8.0 (ESHA Research, Salem, Oregon). Paired student t-tests were used to analyze dietary intake between groups. Time effects, treatment effects, and time by treatment interactions were analyzed using a repeated-measure MANOVA. Individual group time-point comparisons were analyzed using Tukey's Post Hoc test. Statistical analysis was conducted using Jump 7.0 (JMP, Cary, NC) with the alpha level held at p ≤ 0.05. Expected increases in both groups across time were observed for myoglobin, subjective pain, CRP, arm girth, arm volume, protein carbonyls, and TBARS at the p ≤ 0.01 level. Similarly, expected decreases in both groups were observed across time for FAA, RAA, percent peak torque loss, and objective pain at the p ≤ 0.01 level. These results support the expected tissue damage and oxidative stress following fifty maximal eccentric arm contractions. Nutrition: Nutritional intake (Table 1) was not significantly different between groups for kcals, fat, carbohydrates, protein, vitamin A, vitamin C and vitamin E.
Functional markers: RAA (Figure 1) did not significantly change (p ≤ 0.10) between groups. A significant time effect (p = 0.001) was observed for FAA as it increased significantly from baseline (S = 31.3 ± 1.5°, P = 30.1 ± 0.8°) to 12 h (S = 38.2 ± 1.9°, P = 37.5 ± 1.7°) indicating reduced arm flexion. Figure 1: Relaxed arm hang angle immediately, 12, 24, 48, and 72 h following maximal eccentric arm contractions. * trend in treatment effect at 12 h, p = 0.10, time effect p = 0.001. Figure 2: Subjective pain response immediately, 12, 24, 48, and 72 h following maximal eccentric arm contractions. Time x treatment interaction p = 0.03, time effect p ≤ 0.0001. 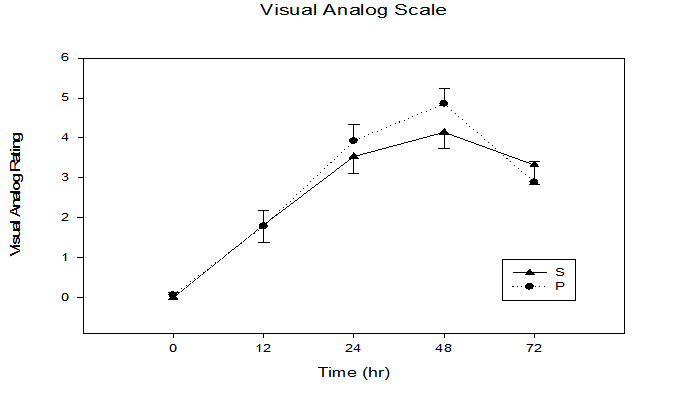 Figure 2 illustrates that there was a significant time x treatment interaction for subjective pain perception utilizing the visual analogue scale (p = 0.03), with an increase from baseline (S = 0.0 ± 0.0, P = 0.07 ± 0.1) to 48 h (S = 4.1 ± 0.4, P = 4.9 ± 0.4). 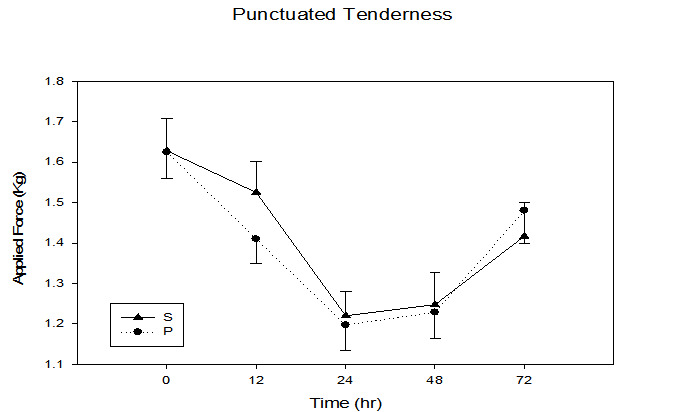 Similar to subjective pain, an objective pain measurement using punctuated tenderness (Figure 3) was significantly different in the P vs. S groups (time x treatment, p = 0.04), with the greatest separation between groups occurring at the 12 h time point (S 1.5 ± 0.2 kg, P 1.4 ± 0.1 kg, p = 0.04). Of the five sites measured, 4 cm proximal to the antecubital fold yielded the greatest punctuated tenderness (Figure 4), with a trend of greater applied force to onset of pain observed in the S group (i.e. 12 hr, S 1.6 ± 0.1 kg, P 1.2 ± 0.1 kg, p = 0.14). Figure 3: Objective pain response immediately, 12, 24, 48, and 72 h following maximal eccentric arm contractions. Time x treatment interaction, p = 0.04, time effect p ≤ 0.0001. Figure 4: Objective pain response at the 4 cm site immediately, 12, 24, 48, and 72 h following maximal eccentric arm contractions. Time x treatment interaction, p = 0.01, time effect p ≤ 0.0001. Arm girth, arm volume, and percent peak torque loss had no significant time x treatment interactions (p = 0.33, p = 0.75, p = 0.47, respectively) or significant differences between groups (p = 0.73, p = 0.59, p = 0.37, respectively). However, figure 5 illustrates a trend of smaller percent peak torque loss in the S group across all sampling times. 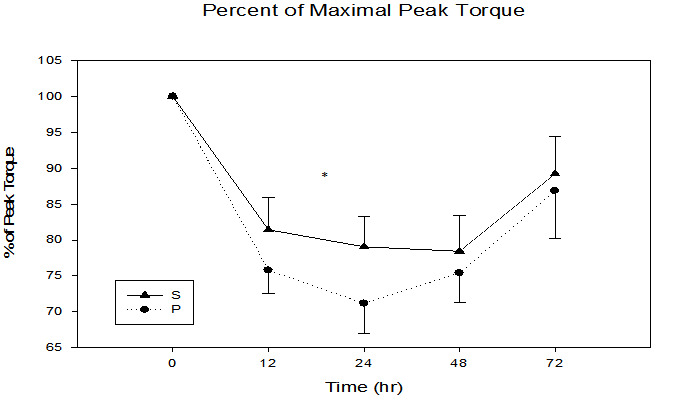 Interestingly, all post-exercise data points for the S group were higher than the P group for percent of maximal peak torque, with the 24 h sample time demonstrating greatest group separation (S = 21.0 ± 4.2, P= 29.0 ± 4.2 % peak torque loss, P = 0.11). Figure 5: Percent of maximal peak torque immediately, 12, 24, 48, and 72 h following maximal eccentric arm contractions. Biochemical analysis for protein carbonyls, myoglobin, and creatine kinase had no significant treatment effect (p = 0.80, p = 0.49, p = 0.28, respectively) or time x treatment interactions (p = 0.83, p = 0.34, p = 0.28, respectively). Myoglobin had the greatest increase from 4 h (S = 7.7 ± 1.8, P = 8.1 ± 1.6) to 24 h (S = 27.9 ± 10.7 ng•ml-1, P = 23.7 ± 3.0 ng•ml-1). Similarly, creatine kinase also had the greatest increase from 4 h (S = 28.6 ± 3.3 U•L-1, P = 24.6 ± 2.7 U•L-1) to 24 h (S = 32.7 ± 7.5 U•L-1, P = 26.4 ± 3.8 U•L1). 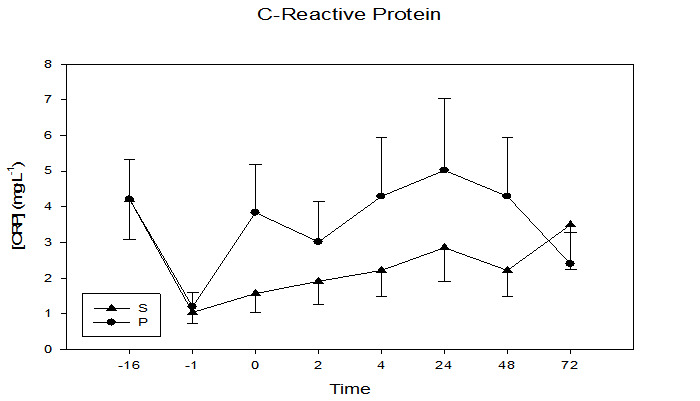 The inflammation marker CRP (Figure 6) demonstrated a significant time by treatment interaction (p = 0.05), with the S group having lower CRP values in five of the six post-exercise sampling times. CRP increased from baseline (S = 1.0 ± 0.3 mg•L-1, P = 1.2 ± 0.4 mg•L-1) to (S = 2.9 ± 1.0 mg•L-1, P = 5.0 ± 2.0 mg•L-1) at the 24 h sample time. 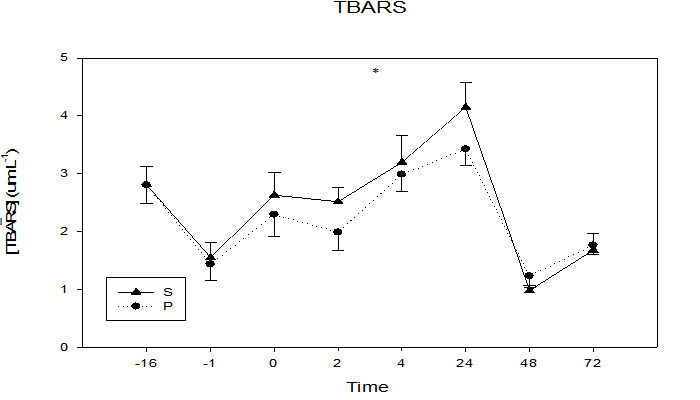 The lipid oxidative damage marker TBARS (Figure 7) was not different between groups (p = 0.11). Interestingly, the first four data points were lower in the S group, with greatest group separation at the 24 h time point (S = 3.4 ± 0.3 μm•L-1, P = 4.1 ± 0.4 μm•L-1, p = 0.10). Figure 6: Plasma concentrations of the inflammatory marker CRP at 16 days and 1 day prior to and immediately, 2, 4, 24, 48, and 72 h following maximal eccentric arm contractions. Significant time x treatment interaction, p = 0.05, time effect p ≤ 0.001. Figure 7: Plasma concentrations of the lipid peroxidation marker TBARS at 16 days and 1 day prior to and immediately, 2, 4, 24, 48, and 72 h following maximal eccentric arm contractions. * Trend in treatment effect at 24 h, p = 0.10, time effect p ≤ 0.0001. Although research of antioxidants has become popular within the past ten years, only two known studies have investigated the effects of cherry ingestion on the attenuation of inflammatory and pain responses[14,15]. Interestingly, the current study is the first to simultaneously investigate the effects of cherry supplementation on muscle soreness indicators and biomarkers of inflammation, oxidative stress, and tissue damage following strenuous exercise. Consumption of the cherry supplement for sixteen days prior to eccentric exercise and three days post-exercise significantly decreased CRP, objective pain, and subjective pain following maximal eccentric arm extensions. No group differences were observed in TBARS, ROM, and percent peak torque loss. In a well controlled study researchers demonstrated that eccentric exercise results in a decline in DOMS following subsequent eccentric exercise of the same limb. However, this repeated bout effect (RBE) was not observed in the contralateral limb. Others have found evidence of a small contralateral RBE following eccentric exercise. Currently, it is unclear if a significant contralateral RBE exists. However, the current study employed a randomized cross-over design to help control for this possible confound. Another possible confounding variable is antioxidant ingestion. To ensure the resulting oxidative stress attenuations were attributable specifically to the ingested phenolic component of cherries and not to other antioxidants in the diet, diet restrictions were put in place, 16 day washout & recovery was utilized, and dietary records were kept by all subjects. In an attempt to increase the effectiveness of the cherry supplementation compared to previous studies, daily cherry consumption was increased to incorporate a daily anthocyanin bioavailability of 120-160 cherry equivalents in tablet form. This is the equivalent of 64 fl. oz. of tart cherry juice, which is considerably more than the 24 fl. oz. of tart cherry juice in the study by Connolly et al., and the 45 cherry equivalents in the study by Kelley et al. In addition to increasing cherry consumption, the current study also increased the number of sample times. Connolly et al. incorporated baseline measures and time points at 24, 48, 72, and 96 h. However, Michailidis et al. using similar methodology, measured exercise-induced oxidative stress markers and found that TBARS peaked at 1.2 ± 0.6 h and remained elevated for an additional 3 h post-exercise, while protein carbonyls were shown to peak at 4.4_ ± 0.5 h and remained elevated for 24 h post-exercise. For this reason, the number of early sample times was increased in the current study to include blood draws immediately post-exercise and 2, 4, 24, 48, and 72 h post-exercise. The present study utilized an exercise protocol consisting of 50 maximal eccentric contractions at a velocity of 30°•s-1. This single bout of exercise resulted in a significant time effect (p = 0.0001) and a decline in mean torque by 58.8% for all subjects from the first contraction to the fiftieth contraction. This reduction in percent peak torque, ROM, and applied force for punctuated tenderness, coupled with an increase in creatine kinase, myoglobin, TBARS, and CRP, support the effectiveness of the exercise protocol in inducing muscle damage and oxidative stress. Following this eccentric protocol, although not approaching statistical significance, greatest group separation in peak torque loss was observed at the 24 h time point with all post-exercise samples lower in the S group (p = 0.11). The S group demonstrating an 8% smaller contractile force loss. Connolly et al. found that ingesting cherries following a bout of unaccustomed eccentric exercise significantly (p < 0.05) diminished strength loss by 18% compared to a placebo trial. Interestingly, the placebo group in the current study experienced a 20% decline in peak torque, whereas the placebo trial decreased by only 4% in the study by Connolly et al.. These differences between the two studies may be due to a greater eccentric overload utilized in the current study as subject performed 10 more maximal contractions than subjects in the Connolly study. Presumably, the greater eccentric overload experienced by subjects in the current study may have resulted in smaller absolute differences between the S and P groups. Although the variability in effort throughout the subject pool or greater eccentric overload in the current study may have accounted for the differing levels of significance, The lack of significant difference between groups in the current study is not clear at this time. A study published in the American Journal of Clinical Nutrition found that tart cherries rank fourteenth in the top fifty foods for highest polyphenolic content per serving size. Polyphenol's have a similar structure to Vit E which has been shown to inhibit lipid peroxidation following an acute bout of heavy exercise. This may explain the trend observed in treatment effect (p = 0.10) for TBARS in this study. As the first study to explore the relationship between cherry supplementation and TBARS, this potential ability of polyphenolic compounds to quench free radicals and reduce biomarkers of lipid peroxidation provides promising future research studies utilizing larger sample size to investigate the effects of varied amounts of cherry supplementation in fighting oxidative-induced tissue damage and disease. Lipid peroxidation has been linked to an increase in tissue damage, causing an efflux of CRP from the affected tissues and initiating an inflammatory response. Cherry supplementation in this study had a significant time by treatment interaction effect (p = 0.05) on the inflammatory marker CRP, with the S group having consistently lower CRP levels compared to the P group. CRP had a more significant change than other inflammatory markers measured in this study (limb girth and limb volume) possibly due to highly developed CRP assays with a sensitivity of detection as low as 5 mg•L-1. Additionally, it is less sensitive to confounding variables such as hydration status and site-specific volume assessment than other inflammatory markers such as limb volume and limb girth. Given the sensitivity and reliability of CRP as an inflammatory marker, the significant time by treatment effect in this study suggests that cherry supplementation plays an important role in attenuating the inflammatory response following a strenuous bout of eccentric exercise. Inflammation can limit ROM. However, the diminished CRP and inflammation levels observed following cherry supplementation were not associated with significantly improved RAA in the S group. It is noteworthy in Figure 1 the RAA was greater in the S group at 3 of the 4 post-exercise sample times, with a greatest between group difference (p = 0.10) observed at 12 h post-exercise, suggesting enhanced ROM compared to the P group. The current study may have lacked adequate sample size to demonstrate improved range of motion as a power analysis utilizing the current study variances suggests that a sample size of 25 is needed to demonstrate group differences at the p < 0.05 level. The antioxidant-like properties of phenolic compounds may act to inhibit inflammation via Cox-2 inhibition, or as reducing agent to quench singlet oxygen, resulting in decreased oxidative-induced tissue damage that ultimately may result in decreased pain. Objective pain (punctuated tenderness) was consistently lower in the S group with a significant time by treatment interaction between the two groups (p = 0.04) (Figure 3). The measure of subjective perceived pain (visual analog scale) also had a significant time by treatment interaction (p = 0.03), with lower peak pain observed at 24 and 48 h post exercise in the S group (Figure 2). Similarly, Connolly et al. also found a significant decrease in subjective pain for the cherry supplement group following eccentric exercise. However, the researcher's found no significant differences between groups for subjective pain. This may have been due to the increased intensity of the eccentric protocol used in the present study, as the total number of repetitions was increased from 40 eccentric contractions to 50 strenuous eccentric arm contractions. The effect of cherry supplementation on both objective and subjective pain measurements provide promising results for the effectiveness of cherry supplementation on the attenuation of the painful symptoms of DOMS following strenuous eccentric exercise. Athletes or non-athletes performing strenuous work involving eccentric type contractions have attempted to reduce the oxidative related damage, strength loss, inflammation, pain, and range of motion through a variety of methods. Some of these methods include ingestion of pickle juice, vitamin E, C, berry drinks, multi-vitamins, non-steroidal anti-inflammatory medications and analgesic medications. Based on the current study findings tart cherry supplementation is effective in diminishing inflammatory markers in the blood as well as decreasing perceived pain, both typical manifestations of DOMS. G.M. Kastello, Brownwood Acres Inc., Supported Research. The results of the present study do not constitute endorsement of CherryFlex by the authors or the journal. 1. Howatson, G., Van Someren, K.A. Evidence of a contralateral repeated bout effect after maximal eccentric contractions. (2007) Eur J ApplPhysiol 101(2): 207-214. 2. Østerud, B.,Bjorklid, E. Role of Monocytes in Atherogenesis. (2003) Physiological Review 83(4): 1069-1112. 3. Steinerova, A.,Racek, J., Stozický, F., et al. Antibodies against oxidized LDL – theory and clinical use. (2001)Physiological research, 50(2): 131-141. 4. Beaton, L.J., Allan, D.A., Tarnopolsky, M.A., et al. Contraction-induced muscle damage is unaffected by vitamin E supplementation. (2002) Med Sci Sports Exerc34(5): 798-805. 5. Bloomer, R.J., Falvo, M.J., Schilling, B.K., et al. Prior exercise and antioxidant supplementation: effect on oxidative stress and muscle injury. (2007) J IntSoc Sports Nutr4: 9. 6. Bloomer, R.J., Fry, A.C., Schilling, B.K., et al. Astaxanthin supplementation does not attenuate muscle injury following eccentric exercise in resistance trained men. (2005) Int J Sport Nutr Exerc Metab. 15(4): 401-412. 7. Bloomer, R.J., Goldfarb, A.H., McKenzie, M.J., et al. Effects of antioxidant therapy in women exposed to eccentric exercise. (2004) Int J Sport Nutr Exerc Metab. 14(4):337-388. 8. Bryer, S.C., Goldfarb, A.H. Effect of high dose of vitamin C supplmentation on muscle soreness damage, function, and oxidative stress to eccentric exercise. (2006) Int J Sport Nutr Exerc Metab16(3): 270-280. 9. Kelly, D.S., Rasooly, R., Jacob, R.A., et al. Consumption of bing sweet cherries lower circulating concentrations of inflammatory markers in healthy men and women. (2006)J Nutr136(4): 981-986. 10. Morillas-Ruiz, J., Zafrilla, P., Almar, M., et al. The effects of an antioxidant-supplemented beverage on exercise induced oxidative stress: results from a placebo-controlled double-blind study in cyclists. (2005) European Journal Applied Physiology 95(5-6): 543-549. 11. Seeram, N.P., Momin, R.A., Nair, M.G., et al. Cyclooxygenase inhibitory and antioxidant gyanidin glycosides in cherries and berries. (2001)Phytomedicine 8(5): 362-369. 12. Steinerova, A. Racek, J., Stozický, F., et al.Antibodies against oxidized LDL – theory and clinical use. (2001) Physiological research 50(2): 131-141. 13. Blau, L.W. Cherry diet control for gout and arthritis. (1950) Tex Rep Biol Med. 8(3): 309-11. 14. Koenig, W., Sund, M., Frohlich, M., et al. C-reactive protein, a sensitive marker of inflammation, predicts future risk of coronary heart disease in initially healthy middle-aged men: results from the MONICA (Monitoring Trends and Determinants in Cardiovascular Disease) Augsburg Cohort Study, 1984 to 1992. (1999)Circulation. 99(2): 237–242. 15. Connolly, D.A.J., McHugh, M.P., Padilla-Zakour, O.I., et al. Efficacy of tart cherry juice blend in preventing the symptoms of muscle damage. (2006) Br J Sports Med. 40(8): 679-683. 16. Michailidis, Y., Jamurtas, A.Z., Nikolajdis, M.G., et al.Sampling time is crucial for measurement of aerobic-exercise induced oxidative stress. (2007) Medical & Science in Sports & Exercise39(7): 1107-1113. 17. Steinerova, A., Racek, J., Stozicky, F., et al. Autoantibodies against oxidized LDL in the first phase of life. (1999) Clinical Chemistry an Lab Medicine, 37(9): 913-917. 18. Sumida, S., Tanaka, K., Kitao, H., et al. Exercise induced lipid peroxidation and leakage of enzymes before and after Vitamin E supplementation. (1989) International Journal of Biochemistry 21(8): 835-838. 19. Connolly, D.A.J., Reed, R.V., McHugh, M.P. The repeated bout effect: does evidence exist for a cross-over effect exist?. (2002) J. Sports Sci Med 1(3): 80-86. 20. Hunter, K.D., Faulkner, D.A. Plyometric contraction-induced injury of mouse skeletal muscle: effect of initial length. (1997) J ApplPhysiol 82(1): 278-283. 21. Kanter, M.M., Nolte, L.A., Holloszy, J.O. Effects of an antioxidant vitamin mixture on lipid peroxidation at rest and postexercise. (1993) J ApplPhysiol74(2): 965-969. 22. Rice-Evans, C.A., Miller, N.J., Bolwell, P.G., et al. The relative antioxidant activities of plant-derived polyphenolic flavonoids. (1995) Free Radical Research 22(4): 375-383. 23. Lee, J., Goldfarb, A.H., Rescino, M.H., et al. Eccentric exercise effect on blood-oxidative stress markers and delayed onset of muscle soreness. (2002) Med Science Sports Exerc 34(3): 443-448.